onthetableblog | Adventures as a massage therapist, on and off the table. With the Thanksgiving holiday fast approaching, it made me think about being thankful and being mindful to say “thank you” whenever possible. Instead of the typical Christmas postcards I send out with a coupon to wish my clients happy holidays and offer a special discount to thank them for their loyal service, I decided to do an autumn one. It has pretty fall colors and the text “celebrate fall.” This also helps to avoid potentially offending people by saying “Merry Christmas.” Everyone can find a reason to celebrate the beautiful changing colors of Fall. It has been a trend on Facebook lately for people to post what they are thankful for everyday the whole month of November. In my opinion, we should be thankful for people and things everyday, not just during a particular time of year. I am a huge fan of social media, but saying it in person means so much more. Letting your clients know how much you appreciate their business is an important aspect of client retention. This can be done either by sending out postcards, texts, e-mails, or in person. A nice touch is to offer a discount in addition to the correspondence. This may encourage a client you haven’t seen in a while to visit you and treat themselves during this often stressful time of year. Once I get my website up and running, I plan to send out postcards notifying my clients of it. First I need to figure out how to put one together that I can be proud to show off. How do massage and chiropractic benefit eachother? In a business like massage, I am often asked questions like, “don’t your hands hurt?” and “aren’t you tired after doing a massage?” The truth is, sometimes I am. But, there are a few things that can be done to prevent injury and promote the longevity of your massage career. In massage school, there was an entire class devoted to ergonomics and body mechanics. I try to apply the teachings to my practice as well as in everyday life. I cringe when I hear about clients giving their loved ones massage and hurting themselves in the process. They say, “I don’t know how you do this for a whole hour, I can only do five minutes.” Obviously the ideal situation would be owning your own massage table. You can purchase a decent one from massage warehouse for about $200.00. It may be a nice addition to your home gym. In most cases, people are practicing at-home massage on a soft surface like the bed or couch. The truth is, when performing a massage the amount of pressure applied is not coming from my hands. It is coming from my own body weight. It is impossible to use your body weight sitting side by side on the couch. Why not have your loved one seated on the floor so you are able to lean into the muscles using your body weight. Also, try to use your forearms, knuckles, fists, and elbows. Lastly, remember to stack your joints. It is a kind gesture to offer a massage to your friend or loved one, but be sure to use proper body mechanics so you don’t injure yourself in the process. If you own a table, a massage therapist will often come to your home for a discounted outcall rate. 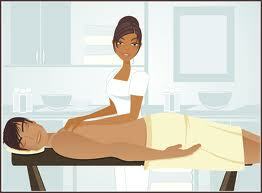 For a true relaxing experience, book a massage at your practitioner’s place of business. An obvious benefit, you don’t have to clean your house.